Roland JD-XA Analog/Digital Crossover Synthesizer. If you own the JD-XA Analog/Digital Crossover Synthesizer, you’ll want to check out the recent Version 1.50 update. This user-installable system software refreshes the 256 onboard programs with all-new sounds created by our top programmers. The update also adds a Copy Program function that gives you quick access to any of these new sounds, even if you choose not to install them after updating your system. Read on to listen to sound examples and learn more about the Version 1.50 update for the JD-XA synth. Elle Rae’s new song “Into The Fire” was released on Hasbro’s Transformers compilation CD today (on iTunes)! We caught up with Elle Rae front woman (and longtime Roland friend Lisa Harriton) to get under the hood of her new song and to find out what inspires her creative process. And Lisa’s JD-Xi makes a cameo in the new “Into The Fire” music video below. You can catch a quick glimpse of her FA-08 Music Workstation and JUNO-Gi rig in the video, too. If you’ve been lusting after the warm, rich sounds of Roland’s classic JUPITER-8, JUNO-106, and JX-3P analog synths from the 1980s and can’t get your hands on the originals, you won’t get any closer than the Roland Boutique series. Consisting of the JP-08, JU-06, and JX-03 sound modules, the series employs Roland’s acclaimed Analog Circuit Behavior (ACB) technology to recreate the sound and response of the original legends with stunning accuracy. If you haven’t had a chance to hear the Roland Boutique series in person, check out the great new audio demos we’ve recently created using the factory patches in each module. 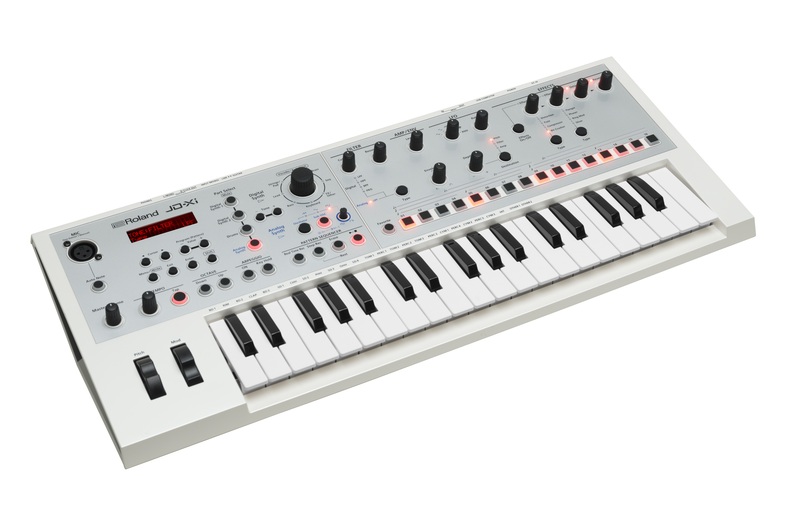 Roland JD-Xi Interactive Crossover Synthesizer in White. Now available in an all-white body while supplies last, the compact JD-Xi synth is powerful, versatile and fun. Rear panel of JD-Xi in White. The Roland Boutique modules alongside their historic analog counterparts from the 1980s.